On November 6, 1971 the United States military detonated the 5-megaton Cannikin nuclear device deep in the earth at Amchitka Island, Alaska. They were testing the effectiveness of the weapon's design as well as new tools made for measuring seismic shifts. This explosion stands as the largest in national history and many feared it would create earthquakes throughout the region. The apprehension was due to Amchitka, or Amchixtax̂, sitting on the Aleutian chain, along the tectonic trench that allows a warm current to flow from the waters proximal to Japan up to Kodiak beaches. The island, previously inhabited for thousands of years, lies approximately 1300 miles southwest of Anchorage Alaska, bordering on the United States side of the chain. Cannikin was the final of three tests on Amchitka and its detonation coincided with the passage of the Alaska Native Claims Settlement Act December 18, 1971 (43 U.S.C. 1601). The settlement proved the most considerable agreement the nation had contracted with an Indigenous group. Through the nullification of Alaska Native claims to land and water rights the public law established village and regional corporations to manage lands (parcels not transferred to state and federal holdings through the agreement) in fee-simple status. The clip below presents the Cannikin detonation on Amchitka. Watch the ground rumble and consider the shock the sea mammals felt as it relayed through the water. The distance of weeks between Cannikin and the passage of the Alaska Native Claims Settlement Act proves haunting to say the least. The explosion embodied the peak of the nation's technological progress-narrative. In a blast 400 times larger than the bomb dropped on Hiroshima, "little boy," it was reportedly without injury to humans. Not accounting for the other damages to the island nor the living creatures on or around it, there are reports that Cannikin claimed the lives of thousands of sea otters, a mammal important for the subsistence traditions of "Aleut" cultures. Relationally, the Alaska Native Claims Settlement Act opened the Alaska region for oil companies and other businesses interested in resource extraction and exploitation. That the government detonated the bomb previous to the passage of the settlement reverberates an uncanny symbol for the transfer of Native occupancy rights to the nation. What must have Native leaders thought when they witnessed the explosion on television or read about in newspapers? Did it lend a coercive element to the settlement process? Were they even informed of the development? The parallels with Cannikin and the Alaska Native Claims settlement to other events in the nation's history are numerous. To list a few, analogies to Hiroshima, Wounded Knee, and the Bear River Massacre abound. The archive reveals this personal photograph below of Nick Neuzorof (left), Inokenty Golodov (right). They are two Unangax̂, Unangan, men working on the island in 1961. During World War II Amchitka was at the heart of the pacific theater of battle between the United States and Japan. For a host of reasons brought on through national authority by the early 1940s Native folks no longer resided there, nor used the island as a place for subsistence practices. After the war the island hosted ports, landing strips, and communications systems left over from the war. In the birth of the Cold War the government began considering the island for nuclear tests in the 1950s. By the early 1960s plans were underway for the first test in 1965. Mr. Neuzorof and Mr. Golodov were apparently employed by one these enterprises on the island. Beneath that photograph is another taken over a decade later of Bureau of Indian Affairs official Bert Bauer, paying Billy B. Johnson, in the role of representing the 13th corporation, over 7 million dollars for the extinguishment of land claims with the nation. How may have the Cannikin bomb influenced the settlement process? Nick & Innokenty, Amchitka Island, Nick Neuzorof (left), Inokenty Golodov (right), Aleut. "Handing over the first money the 13th received." 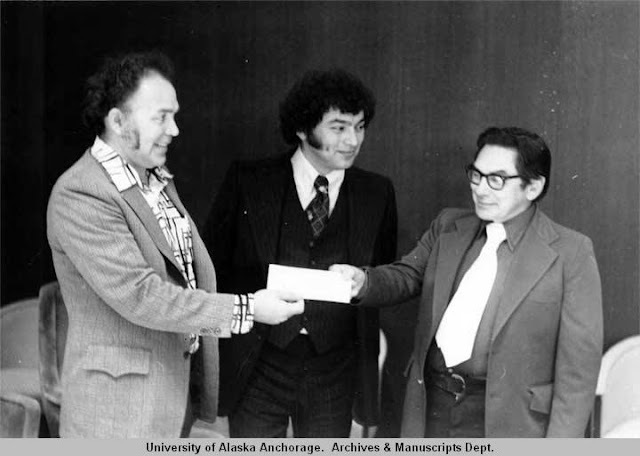 While the research for this blog dilates Alaska Native studies the obvious connection point between Cannikin and the Alaska Native Claims Settlement in the archive lies with the late senator from Alaska, Ted Stevens. 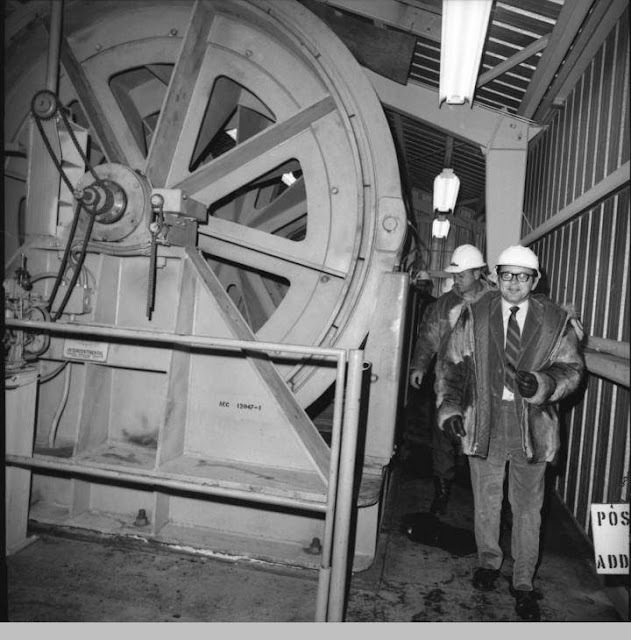 Stevens invested his long life with decades of service to Alaska and the claims settlement was a paramount contribution he helped engineer into regional history. Below is a one-minute clip with Stevens discussing the Alaska Native Claims Settlement Act in regard to a debate in 1992 about Native subsistence practices. Here is the Senator, one of many photographs, touring the facilities and grounds on Amchitka in 1971, before the nuclear detonation and the Alaska Native Claims Settlement fashioned into law. Sen. Stevens, Amchitka, Atomic blast project. 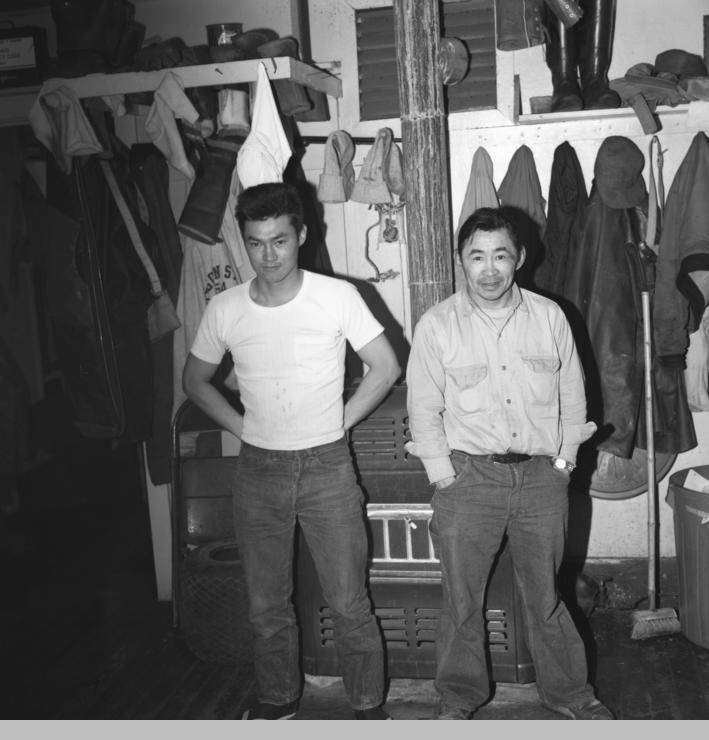 Another photograph places the senator with two unnamed Unangax̂, Unangan, workers at Cannikin also in 1971. 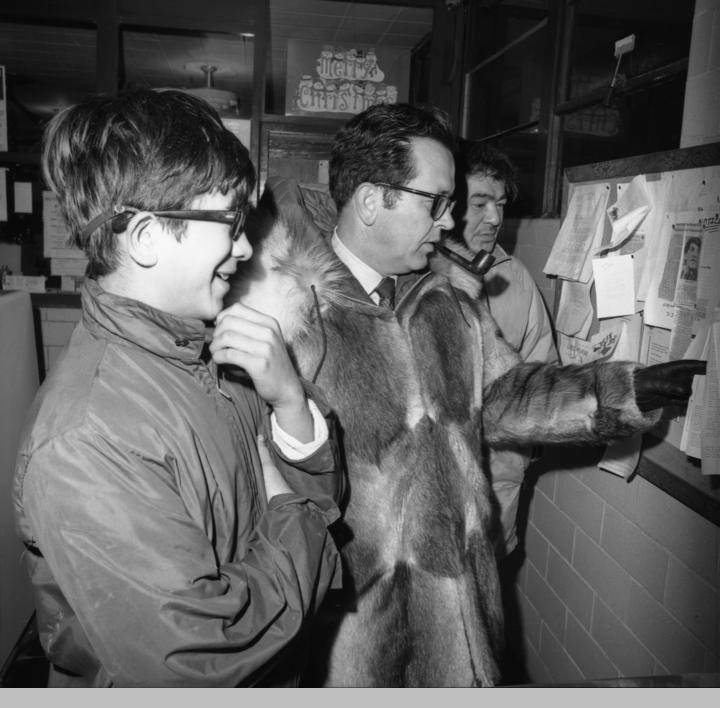 The younger man is the foreground wears a nylon jacket while the Senator adorns a fur coat. The fondness of nylon jackets by Native people of that generation always makes me smile, even in a foreboding image as this. I'd imagine they're hard to find these days. "Sen. Ted Stevens w[ith] Aleuts of St. Paul, atomic blast project." The detonation and the settlement present an interesting riddle. Growing into adulthood I learned more than just the basics about Alaska Native Claims settlement Act through lived experience but only through research have I scratched upon the profundity of the relationship the settlement possesses with the nuclear tests.